Southerh Sand Beach at Rancourt Preserve. Photo courtesy of the Androscoggin Land Trust. This 14-acre preserve is owned by the Androscoggin Land Trust and is a component of the Androscoggin Greenway. The property was purchased from the City of Lewiston with Land for Maine’s Future water access funds in 2007. 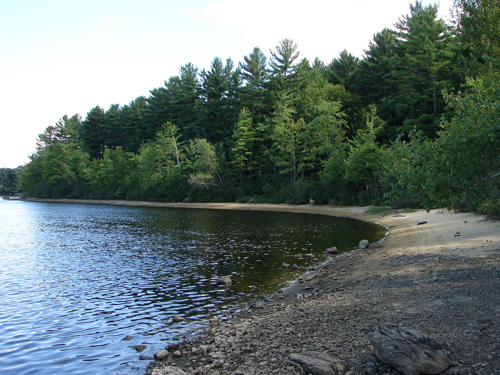 The property contains a walking trail, two beautiful sand beaches along the Androscoggin River, and a scenic overlook. In 2008 the property was dedicated in the name of Deputy Sheriff David Rancourt who tragically lost his life in the line of duty in the Androscoggin River. David Rancourt River Preserve, Lewiston, Androscoggin County: This 14-acre preserve is owned by the Androscoggin Land Trust and is a component of the Androscoggin Greenway. The property was purchased from the City of Lewiston with Land for Maine’s Future water access funds in 2007. The property contains a walking trail, a hand-carry boat launch, two beautiful sand beaches and a scenic overlook. View more.